Matt Adams - Superheroes, Sci-Fi, and a Touch of the Fantastic: A Journey through "In Memoriam"
I called my wife as I started the 25-minute journey from home today and she informed me that I had a package waiting for me. I wasn't expecting anything--after all, I haven't ordered anything online since Christmas--but I finally put it together: my contributor's copy of A Thousand Faces had arrived! The pristine cover of this fine publication. A familiar author penned this story. As I flipped through the book eager to again read the fine stories contained within, I spotted something on the last page that made me smile. A Thousand Faces accepted another work of mine...which was actually promoted! 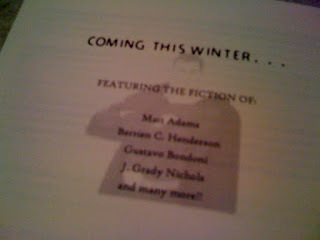 It's blurry...but if you squint really hard, you can see that certain familiar author's work promoted for the next issue! 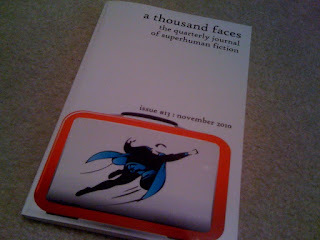 A Thousand Faces publishes quarterly. 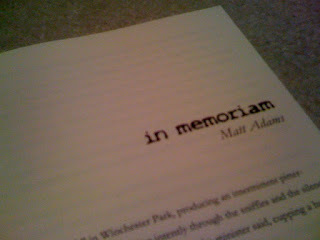 My next story, "The Villain," will appear in the March 2011 issue, which is coming soon! Make sure to check out A Thousand Faces for updates! Of course, when it's up, you'll hear about it here!